Ned Kelly, captured wounded but living! There is an endless supply of fascinating records in the Queensland State Archives collection. Exploring the Queensland State Archives online catalogue recently, the name of Australia’s most infamous bush ranger, Ned Kelly, unexpectedly grabbed attention while searching late 19th century records. 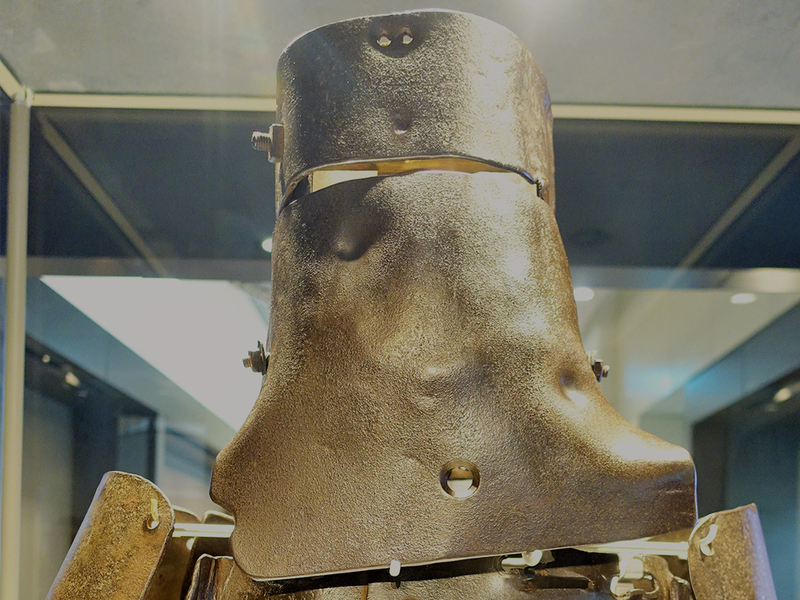 Nowadays, the majority of Australians know the name Ned Kelly or at least recognise his iconic suit of armour with its bucket-like helmet and vest fashioned from a metal plough. Many Australians might also be aware that Ned Kelly and his gang of bushrangers roamed Australia’s southern Victorian outback, many days ride from the Queensland border. Intriguingly, the Queensland records add weight to the argument that Kelly’s notoriety had already travelled far outside the Victorian colony by 1880, with news of his capture eagerly passed on to the Queensland authorities by telegram on the same day. It is exciting to reflect on whether the authors of these early electric ‘tweets’ had any idea of the historical interest their correspondence would garner nearly 140 years into the future. The first record of interest held at the Queensland State Archives is a telegram from Robert Ramsay, Chief Secretary, to the Colonial Secretary, Sir Arthur Hunter Palmer, in Brisbane reporting the capture of Ned Kelly – wounded but alive, and the other three members of the gang shot dead – sent from Melbourne 28 June 1880. 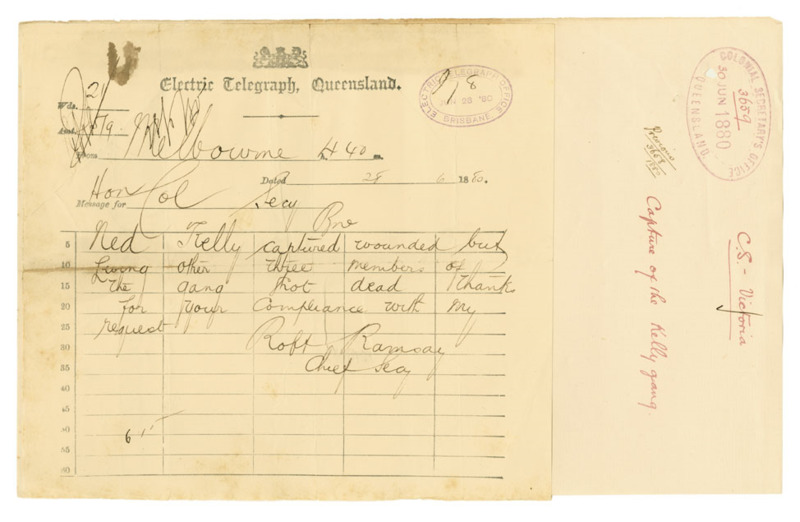 Chief Secretary Ramsey, using the telegraph service that had only been operational in the Queensland colony since 1861, announced: “Ned Kelly captured wounded but living other three members of the gang shot dead”. By the time of his capture, Kelly and his gang had evaded the Victorian police for several years; starting with the 23-year-old Kelly’s assault charges in 1878 and cumulating in the shooting deaths of several police officers and two bank robberies by mid-1880. The pursuit of the Kelly Gang, as they came to be known, came to a violent end about 6:45 am on the bitter cold Victorian morning of 28 June 1880 when Kelly was shot several times and captured alive. As Kelly fell to the ground, the charred remains of the Glenrowan Inn, roughly 250km north of Melbourne, smouldered. Nearby lay the burnt remains of Kelly’s younger brother Dan and friend Steve Hart covered by a white sheet, having died in the fire the police had started the previous day to smoke out the gang members from the Inn. Friend Joseph Byrne had also been shot in the groin and died from his wound. I saw the lot of them. Ned the leader of the gang being the only one taken alive. He was lying on a stretcher quite calm and collected notwithstanding the great pain he must have been suffering from his wounds. He was wounded in 5 or 6 places. Only on the arms and legs. His body and head being encased in armour made from the moule boards of a lot of ploughs. Now the farmers about here have been getting their moule boards taken off their ploughs at night for a long time but who ever dreamed it was the Kellys and that they would be used for such a purpose. 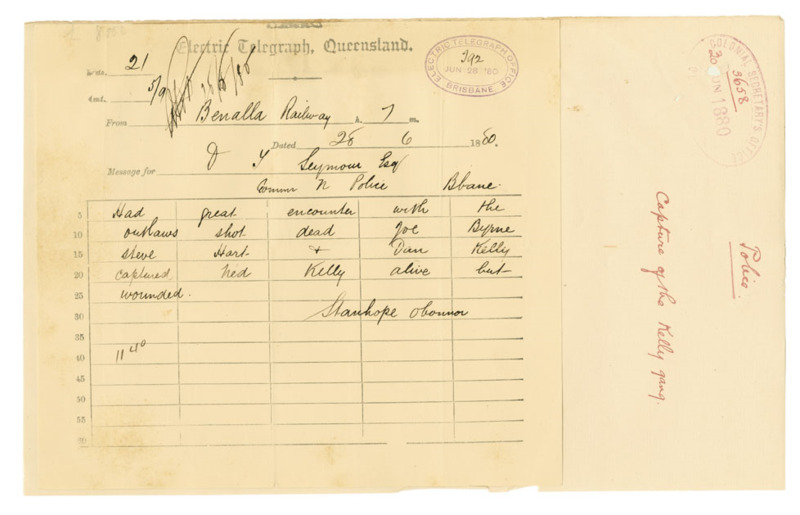 The second record of interest held at the Queensland State Archives is a telegram from Sub Inspector Stanhope O’Connor to the Commissioner of Police, David Thompson Seymour, Brisbane, regarding the capture of Ned Kelly and the shooting of Joe Byrne, Steve Hart and Dan Kelly, sent from Benalla Railway 28 June 1880. Sub Inspector Stanhope O’Connor announced: “Had great encounter with the outlaws shot dead Joe Byrne, Steve Hart & Dan Kelly captured Ned Kelly alive but wounded”. The most sanguinary drama of modern Australian times draws to an entirely fitting close. The Kelly gang have been hunted down at last… Certainly since these desperate men first sprang into notoriety by a display of cold-blooded ferocity never, we believe, surpassed in the blood-stained record of bushranging, no more extraordinary scene has been enacted than that on which the curtain has just fallen… Clad in rude armor, constructed either by themselves or by some sympathising blacksmith out of ploughshares, these desperadoes take possession of a township, having previously cut the telegraph wires and torn up the line of railway in the fruitless hope of intercepting succor, and stand a siege in the leading hotel. Finding themselves surrounded and hopelessly outnumbered, they dash out, leaving one of their number dead in the citadel they had defended for eight or nine hours. Their leader had previously, with the view apparently of taking the enemy in rear, escaped into the bush, and as soon as daylight served commenced the attack single-handed upon the besiegers of his comrades. He was shot down and taken prisoner. At a special sitting of the Central Criminal Court on 28 October 1880 before his Honour Justice Redmond Barry Kelly, Ned Kelly was found guilty of wilfully and maliciously murdering Police Constable Thomas Lonigan. Kelly was hanged at 10 o’clock on the morning of 11 November 1880 within the precincts of the Melbourne Gaol. Clearly, the exploits of Kelly and his gang of bushrangers had spread far beyond the Victorian colonial border by the time of Kelly’s capture and the use of the telegraph played a key role in how quickly the information was disseminated. And, whether you regard Kelly as a hero of the people – like his sympathisers at the time of his death – or a vicious villain, there is no disputing that Kelly and his gang remain an interesting part of Australian history. Thank you for this informative insight into one of our iconic bad guys. Thanks Gazza, we’re glad you enjoyed it. Thanks for this blog on Ned Kelly. I was recently in Beechworth and visited the court house where Ned was sentenced to hang. Then on to Glenrowan to the actual site of the seige at the then encampment beside the Glenrowan Train Station timber building which is a replic of the original station house. It was an amazing experience! Hi Maria – that sounds like a great trip to some fascinating places. Glad you enjoyed our blog.